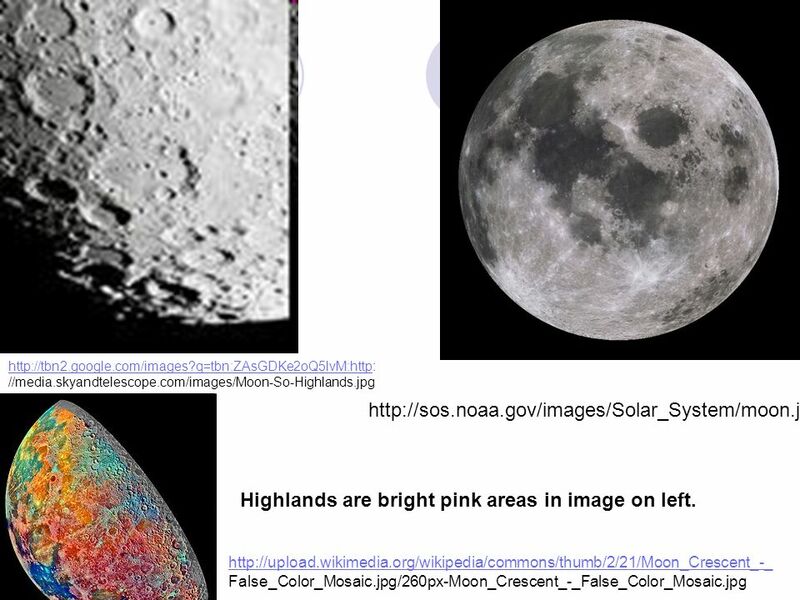 6 Highlands are bright pink areas in image on left. 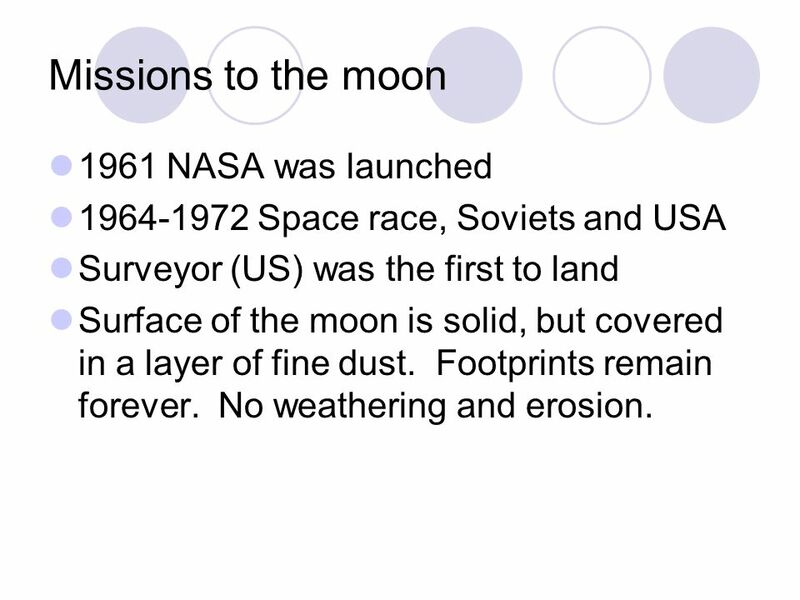 Space race, Soviets and USA Surveyor (US) was the first to land Surface of the moon is solid, but covered in a layer of fine dust. Footprints remain forever. No weathering and erosion. 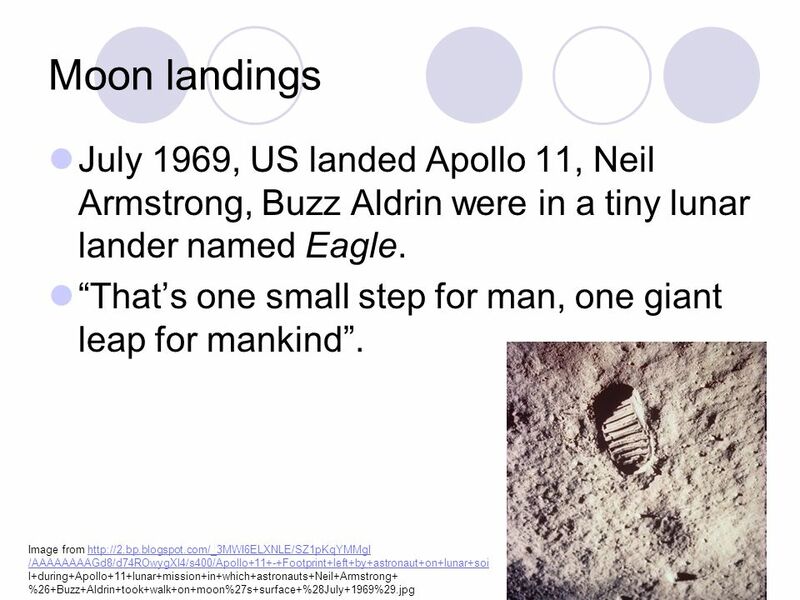 10 Moon rocks Everything we know about the moon was found out from the moon rocks brought back from the moon landings. 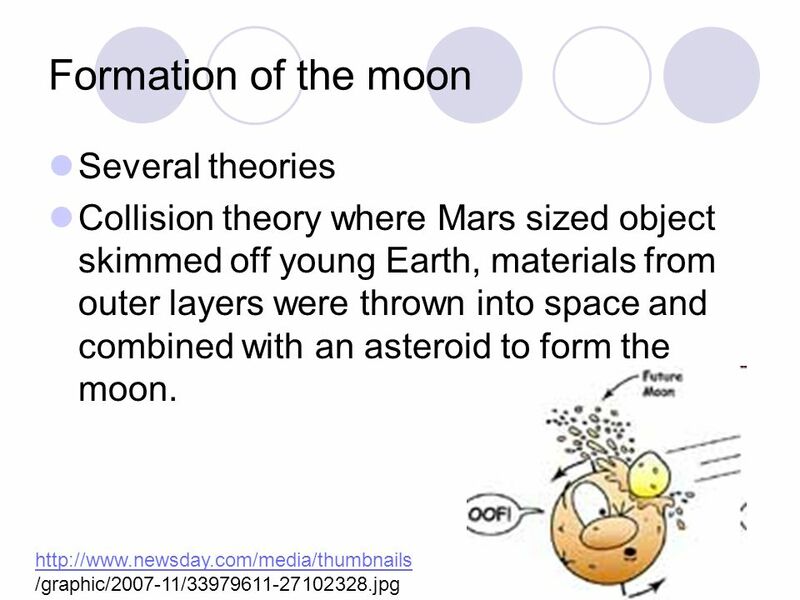 Almost all of the moon rocks were formed by cooling of molten material. (volcano) The surface of the moon was once very hot. Also evidence of meteor bombardment. 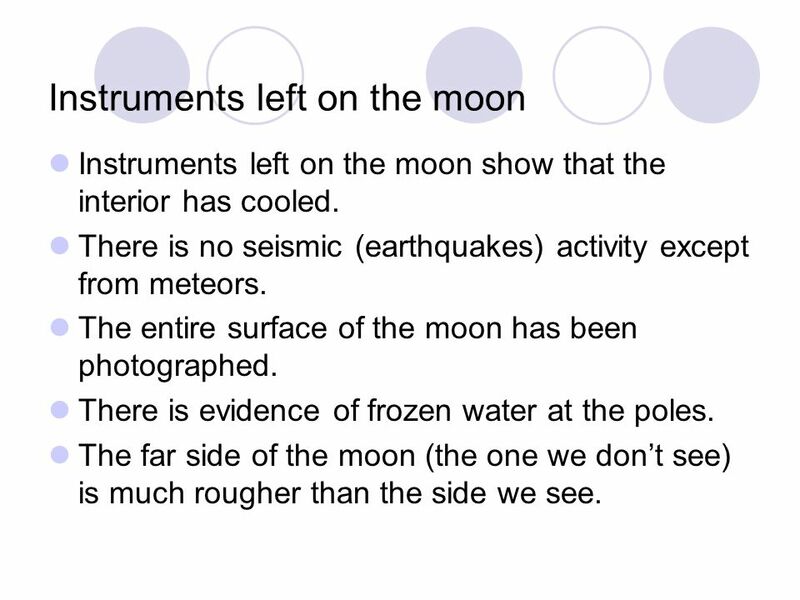 Instruments left on the moon show that the interior has cooled. There is no seismic (earthquakes) activity except from meteors. The entire surface of the moon has been photographed. There is evidence of frozen water at the poles. The far side of the moon (the one we don’t see) is much rougher than the side we see. 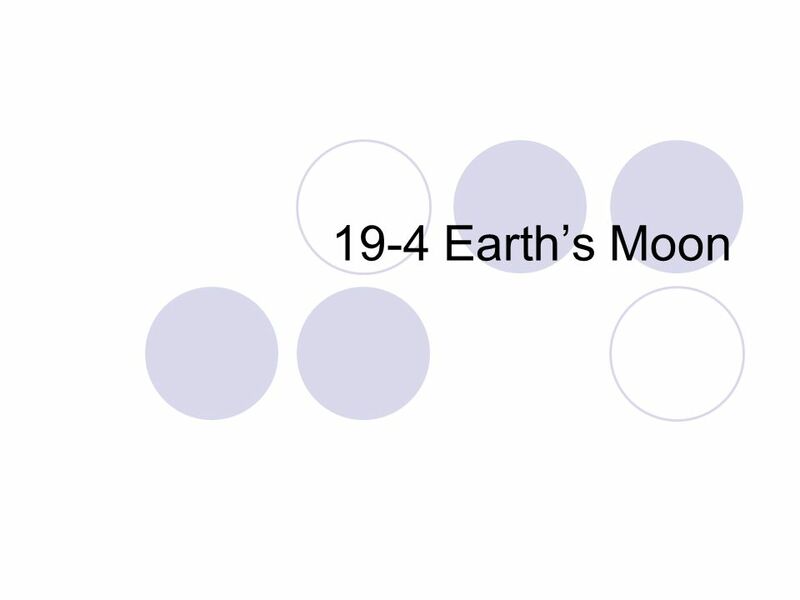 Download ppt "19-4 Earth’s Moon." Earth’s Moon Chapter 1, Section 4, p30-33. 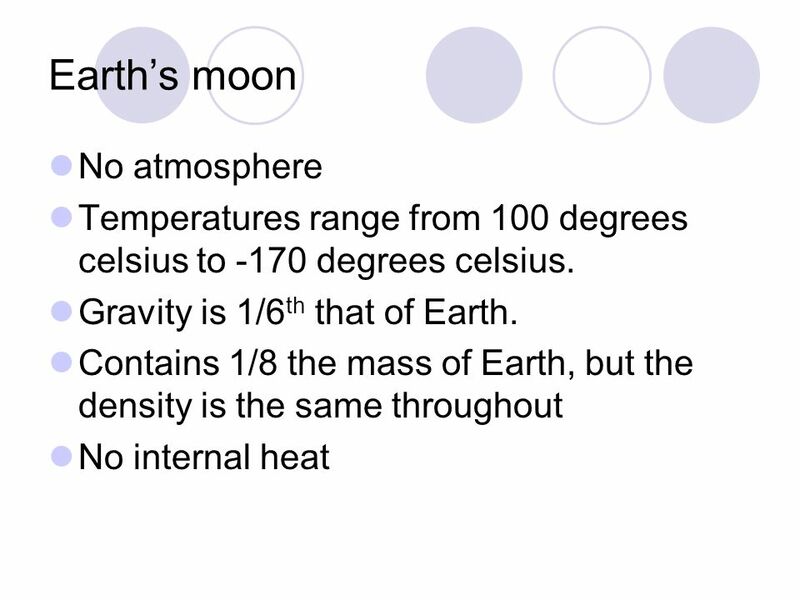 The Earth and Its Moon Part 2: The Earth’s Moon. 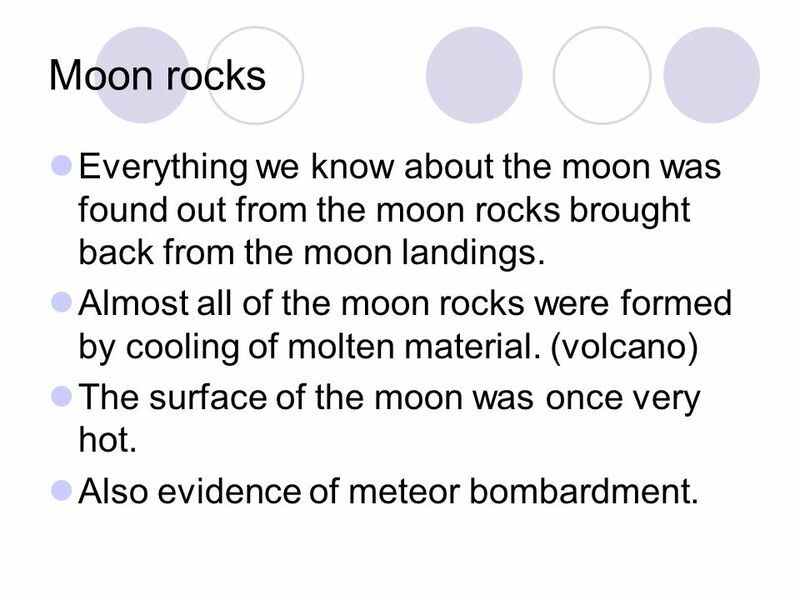 Earth and Its Moon Chapter 4 Earth Science. The Earth - The third planet from sun - Takes days to travel around the sun - Takes hours. 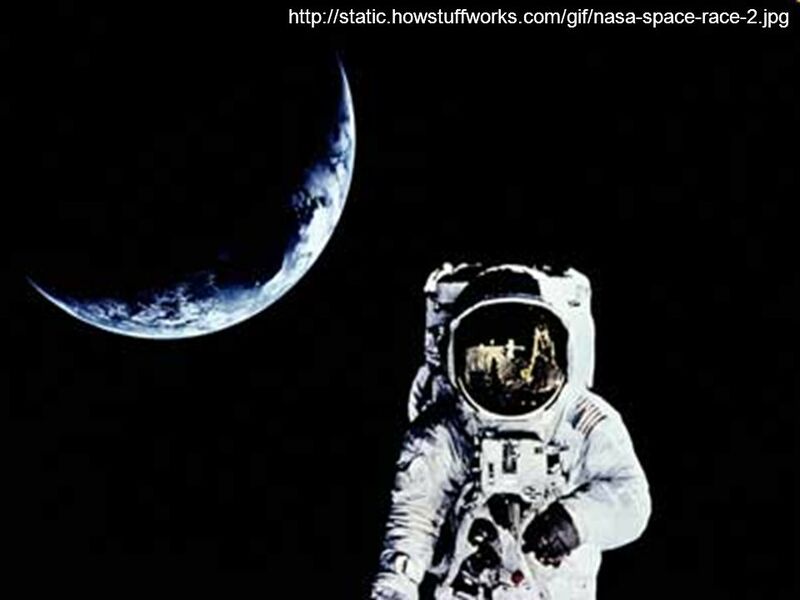 I was the first man to set foot on the moon, I am _______________. 8 February 2005AST 2010: Chapter 8 1 The Moon & Mercury. 13 July 2005AST 2010: Chapter 8 1 The Moon & Mercury. Class 3 : Craters in the solar system. 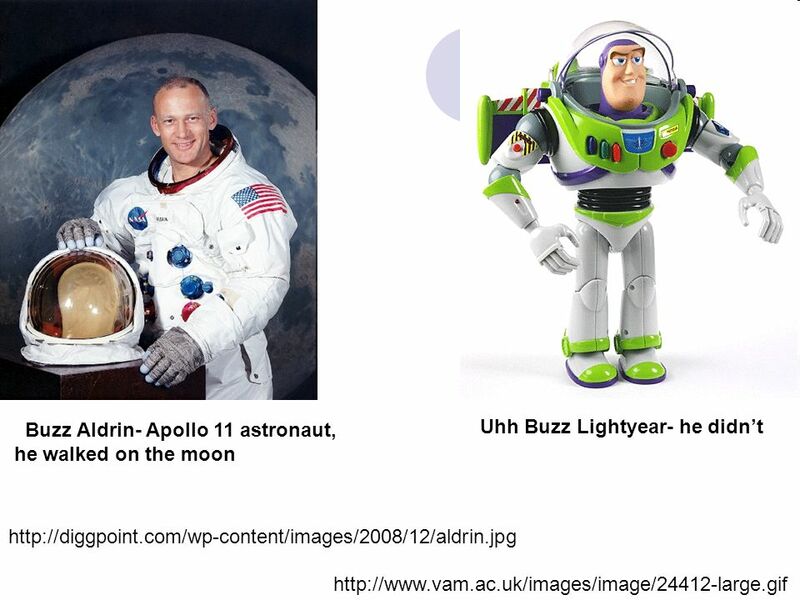 Recap last class… Patterns in the solar system. Theory for solar system formation. How do we test this theory? Variety. The Phases of the Moon Section ain.html#part2. The Moon. 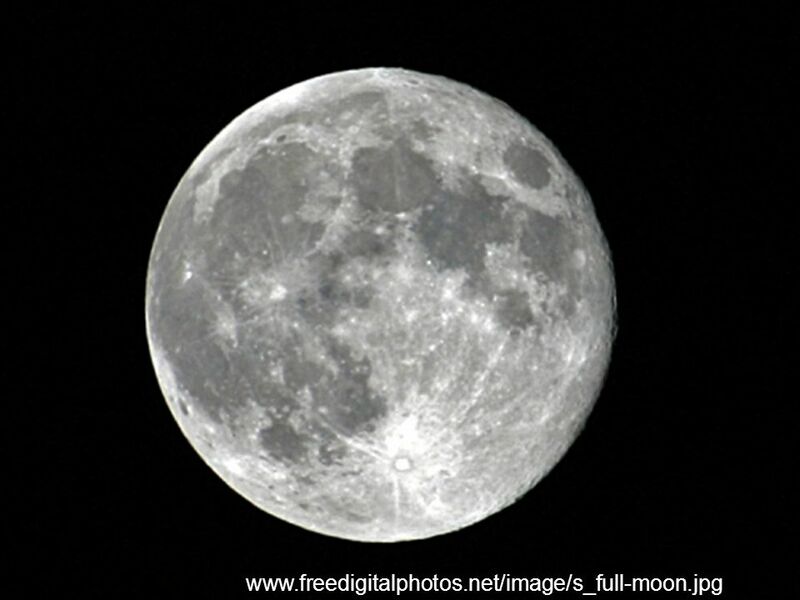 Earth’s Moon National Optical Astronomy Observatories composite image. The Sun. OUR STAR 34 Earth days to rotate at Poles 25 Earth days to rotate at Equator. Journey to the Moon.  384,000 Km away from earth  Diameter of 3,476 Km  Density is 1/80 th of Earth  Temperature range: 130°C to -180°C  No atmosphere. 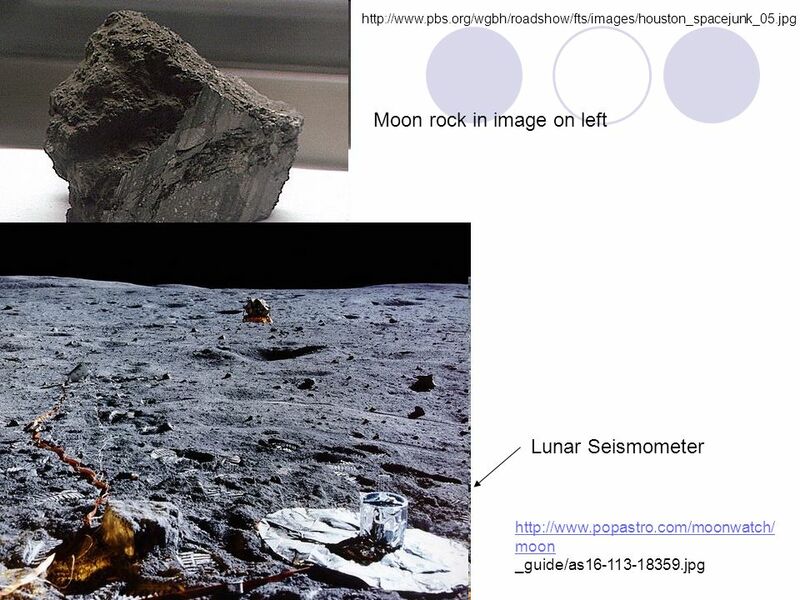 Lunar Geology 1. Internal Layers 2.Seismometer Data 3.Prospector Data 4.Possible Origins 5.Major Surface Features 6.Miscellaneous. 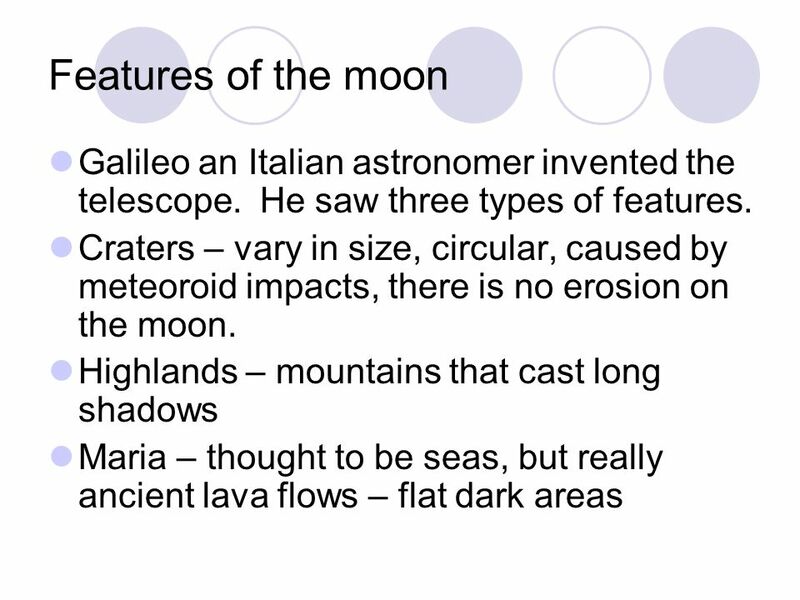 The Moon Researched and compiled by Mrs. Terri Reed 5 th Grade Brookhollow February 2005.